Russian authorities are using the pretext of copyright enforcement to suppress dissent. Unfortunately, the dissenters are often using Microsoft’s proprietary software for their activity, giving the police an excuse to hassle them. 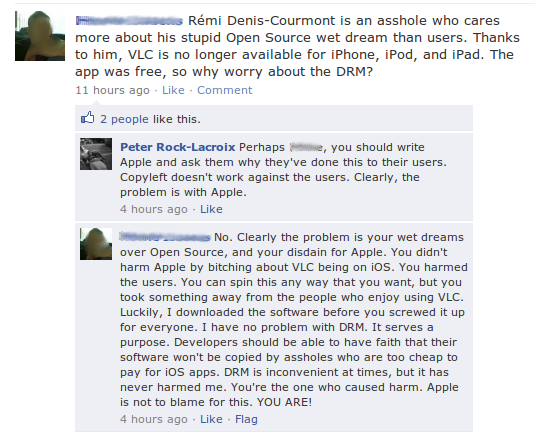 To solve this problem, the activists should use Free software like the GNU/Linux operating system. While Free software can’t ensure the Russian police won’t forcibly stop acts of free speech, it would serve well to defeat this ostensible reason. Jeff Utecht sings the praises for Facebook as an educational tool. While Jeff typically shines at promoting useful tools for educators, I think he goes over the top here. He begins by listing “facts” about Facebook and a couple of them sound more like a sales-pitch than sound educational advice. 1. Everyone, including parents and teachers are already using it. Not only is that false by exaggeration, but an attempt to pass off a bandwagon fallacy (argumentum ad populum for the Latin-minded). 2. Facebook has replaced e-mail for many people. While I know many who use Facebook to message others, I don’t actually know anyone who has completely stopped sending messages via e-mail and relies exclusively on Facebook. Perhaps these people exist, but many? Like microblogging or IM, these technologies have certainly added to our arsenal, but many? 3. Facebook has more privacy settings then (sic) most Internet sites. I think it would be useful (imperative?) to point to sites that serve a similar purpose, then describe how Facebook is superior in this regard. And, given the ugly history of Facebook privacy and the CEO’s contempt toward these issues, this isn’t a strong selling point. Remember who’s in control here…Zuckerberg’s the CEO, b**ch. Yes, the cards have changed, but there’s no indication the man has. 4. Not using Facebook to communicate with your school/class community is like not using Google to search. Apples and oranges. I don’t use Facebook to search nor do I use Google’s search engine to do social networking. Further, I don’t have to sign into Google and tell them who I am in order to use their search engine. I’m not sure what Jeff is getting at here but at best, it’s another bandwagon fallacy. 5. It is the future. While I have no doubt that Facebook will continue to be popular for some time, this “fact” was a real eye-roller. 6. It is the now. See #5. Why hook a school into Facebook instead of developing a private, on-site solution? What does Facebook offer (besides popularity) that a site built on Free/Open Source software like Elgg or a combination of tools like Moodle and StatusNet doesn’t? Sure, going with Facebook sounds easy, but it also sounds like the easy way out – especially for an educational institution that could turn this into a learning opportunity for some technically-inclined pupils and a technical director and/or teacher. I get why banning Facebook in schools is an unwarranted extreme, but I fail to see any value in promoting it as an educational tool for little children. Isn’t this just going from one extreme to another?